Our local air duct cleaning business is known throughout California for high quality duct cleaning, repair and replacement services for home owners and businesses alike. From industrial duct cleaning to kitchen exhaust hoods cleaning, there is nothing our team can't do for you. Air Duct Cleaning Torrance is a company dedicated to the providing various air duct services to all clients in the residential and commercial districts. We always promise our clients excellent quality service, and now we have become quite known for it. This solid reputation is due to the professionals we employ, who possess the knowledge needed for performing duct services, as well as the skills needed to make good use of the latest cleaning equipment that are specifically designed for that purpose. Air duct maintenance that is performed by trained professionals such as us is in demand by many property owners. Maintenance and repair of this level cannot be done by those lacking experience and equipment. Our professionals use special equipment that allows them to clean out the system entirely, which is a something a normal vacuum cleaner cannot do. They are also trained enough to perform such tasks without causing any damage to the duct. As such, using our services will save the client a lot of time and worry. Our service coverage goes beyond cleaning and maintaining ducts. Air duct seal repair and HVAC unit cleaning are also some of the other services we offer our clients. Contaminants inside the ducts can cause much danger to the ducts, and that is why we can offer you these services in order to prevent anything from disrupting its performance. Whatever service you need, our experts can easily deliver. 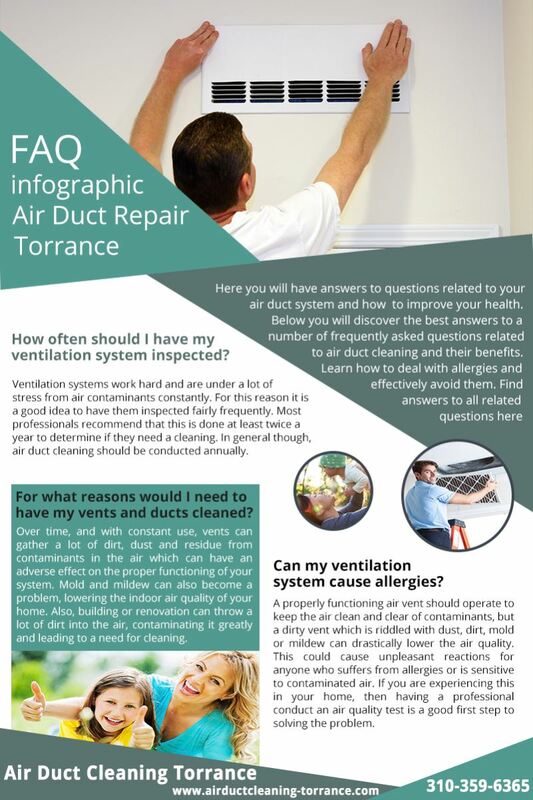 If you need a professional to work on your duct, look no further than “Air Duct Cleaning Torrance”. Give us a call right away, either by hotline or e-mail, and one of our experts will be right there to take a look at the problem. With us on the job, there’s absolutely nothing you need to worry about.